It is crucial to determine the severity of any burn before developing proper burn treatments for the affected area. While mild to moderate burns are common, they still can produce extreme pain. Minor burns typically heal without much required medical attention. Alternatively, a severe burn often requires immediate care to reduce the potential of infection and the severity of scarring. Before treating any burn, it is essential to understand the level or degree of the injury. Burns are categorized in three different levels including first-, second- and third-degree intensities. Usually, a minor burn can be treated by first dousing the area with cold water, while a third-degree burn requires immediate medical attention. First-degree burns tend to be the most common form of burn injury, and often produced through light scalding, when the skin comes in brief contact with hot items, steam or the sun. A first-degree burn will typically appear slightly swollen and red in color that may produce slight to minimal pain. The burn usually affects the top skin layer only, and can often be treated with over-the-counter pain medications and ointments. Second-degree burns are typically three inches in diameter or less and can often be treated the same as a minor first-degree burn. Typically, a second-degree burn will involve blistering, and/or intense reddening with white blotches. Usually the skin swells and experiences severe pain. Cool Burning Skin – Holding the area that has been burned under cool (tepid) running water for at least 15 minutes or so until the pain subsides can reduce swelling to the area. The cool water conducts heat away from the burned skin. However, it is essential to never place ice on the burn. Use Sterilize Gauze – Avoid using fluffy cotton, cotton balls, or any material that would allow lint into the wound. Instead, apply sterilized gauze bandages loosely without pressure over the burned area. This will reduce pain, keep air off the area and safeguard blistered skin. Manage Pain – Usually any over-the-counter pain medication can minimize the pain caused by a first or second-degree burn. These pain relievers include ibuprofen, aspirin, naproxen, and acetaminophen. The painkiller medication should be used only by following the label instructions, or as prescribed by a doctor. A third-degree burn can be extremely serious and life threatening. These types of burns typically involve every labor the skin and cause substantial permanent damage to tissue, muscles, fat and bone. Areas of the body that have suffered severe injuries caused by burns often appear white and dry or charred black. Many times, individuals suffering third-degree burns have difficulty breathing. The burned individual may be a victim of carbon monoxide poisoning or have inhaled other toxins and/or smoke. Never Remove Any Burned Clothes – However, it is essential that the victim be relieved of any contact with heated or smoldering materials and remove from any smoke-filled area. Never Submerge the Affected Area in Cold Water – Immersing burned areas in cold water can cause the body temperature to drop producing hypothermia and/or deteriorate blood circulation and pressure producing shock. Check Vital Signs – It is essential to check the burn victim for vital signs including movement, coughing or breathing. If there are no signs of blood circulation or breathing, it is essential to begin CPR. Elevate Body Parts – If possible, elevate parts of the body that have been burned above the heart. 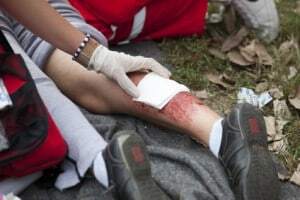 Cover the Area – Cover the burned area with a moist, cool sterile bandage, moist cloth, clean cloth or towel until emergency assistance arrives. Avoid using egg whites, creams, or butter as burn treatments. These substances trap heat in the skin, and minimize the healing process while intensifying pain. Only apply skin healing medicated lotion to the burned area if there are no open sores or blisters. For additional information on the medical-legal implications of burns, view our page here.